In 2012, Corey Mitchell was diagnosed with PNET Ewings Sarcoma, a very rare cancer. The news came just a few days before he was to start the 6th grade in Woodland, Al. He had spent the summer as many southern boys his age had — playing summer baseball. 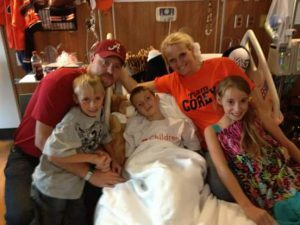 But his family began to notice that something was not exactly right about Corey and after a couple of visits to the doctor, they were sent to Children’s of Alabama in Birmingham. The oldest of three kids, Corey had known one thing his whole life — sports. They had always been very close and highly interactive with each other but since the best treatment for Corey was in Birmingham, they had tough choices to make. He was excited about starting school and getting back into a rhythm, but with his diagnosis his world came crashing down. He could not play sports, he could not go to the 6th grade (high school in his town), and it seemed he could no longer just be a kid. Corey’s family knew they had to make a game plan — they referred to everything they could in sports terms to make the transition easier. They had always been very close and while they all knew the best treatment for Corey was in Birmingham, they had a tough choice to make. Corey’s father was forced to ‘play’ mom and dad to Corey’s siblings, Caroline and Chandler, while also working a stressful, full-time job. Corey’s mom traveled to Birmingham with him for his treatment. Corey spent about 200 days in the hospital, many of which his mom spent at the Ronald McDonald House. Corey is now in remission, but at just 14 years-old, has endured 35 weeks of chemotherapy, 25 radiation treatments, 5 surgeries, 5 chest tubes, has spent 100 days on a feeding tube and 100 days with a chest catheter. His doctors and family refer to these numbers as his “stats,” much like the numbers you would see on the back of a baseball card. 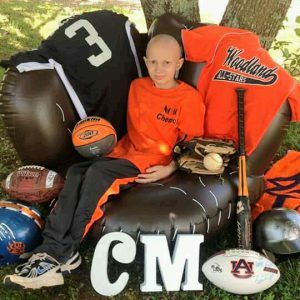 And although much of Corey’s recent childhood has been spent in Birmingham, at the hospital or the Ronald McDonald House, his family has made sure he didn’t miss out on having fun. They have taken advantage of all of the family programming at the House — often attending Barons games, taking trips to the McWane Science Center, and even becoming close with other House guests. Corey’s family have been great teammates for the other families at Ronald McDonald House. Upon each visit to the House, Corey’s family makes signs and crafts to hand out to the families. They leave goodie bags at each door and make sure each family knows they are not alone. This family always had the support they needed and they want to make sure each family feels the same. 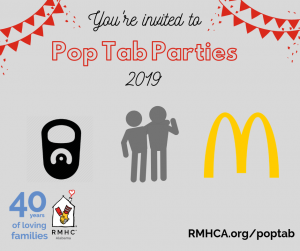 The bonding that takes place at the House is one of the unexpected benefits that constantly surprises everyone and makes this facility a true home away from home for these families in need. You can watch more of Corey’s story in the video below, which was featured at our 2016 Heart of the House Gala.